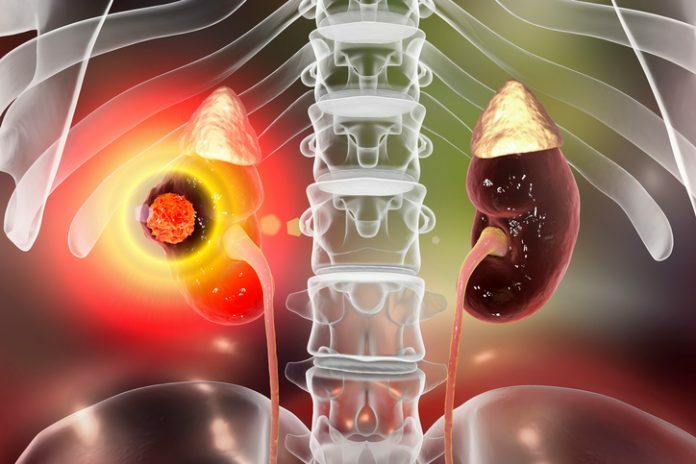 Investigators at Brigham and Women's Hospital (BWH) and Beth-Israel Deaconess Medical Center believe they have found a kidney cancer biomarker—kidney-injury-molecule-1 (KIM-1)—which can be detected in both blood and urine, a discovery that could yield a liquid biopsy test for both disease risk and projected kidney cancer survival. The research team measured KIM-1 concentrations in samples from patients enrolled in the European Prospective Investigation into Cancer and Nutrition (EPIC). The team compared KIM-1 levels from 190 participants who went on to develop RCC within the next five years to 190 matched participants (same age, body mass index, smoking status, etc.) who remained healthy. In samples with detectable levels of KIM-1, the average concentration was double in those who would develop kidney cancer. Interestingly, the investigators reported that adding KIM-1 to a model for predicting kidney cancer risk approximately doubled the accuracy of that model. KIM-1 was substantially more sensitive for kidney cancer detection than prostate-specific antigen is for prostate cancer. However, given how much rarer RCC is, the researchers noted that KIM-1 should be measured along with another kidney disease-specific markers to be useful for early detection in the general population.